Beginning with his first patent for an extendable table whose leaves were hidden underneath when not in use, Hunzinger knew the seamless integration of technology and furniture could be a selling point. Though the Industrial Revolution had already transformed American production, the final decades of the 19th century would thrust the country into modernity, with Hunzinger’s inventions helping to pave the way. “It’s really in the 1870s when our modern world starts to take shape, and we start to recognize the United States that we are today,” explains Barry R. Harwood, a curator of decorative arts at the Brooklyn Museum. “It’s a very pivotal, interesting moment, and Hunzinger is the foremost practitioner of this proto-modern design.” Harwood organized the exhibition and authored the catalog for the museum’s 1997 show The Furniture of George Hunzinger: Invention and Innovation in 19th-Century America, which helped ignite scholarly interest in a designer who already had a strong following among dealers and collectors. 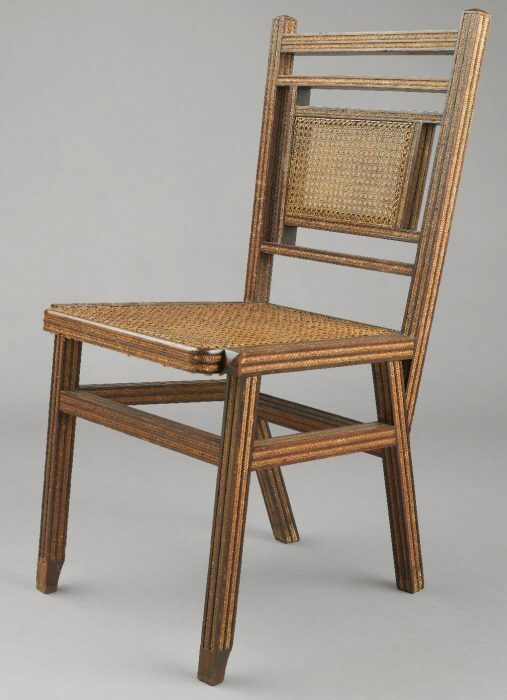 Top: A proto-modern Hunzinger chair design, circa 1876, with wood turned to resemble bamboo. Via 1stDibs. Above left, this chair’s simple frame is partly obscured by lush period upholstery. Via the Brooklyn Museum. 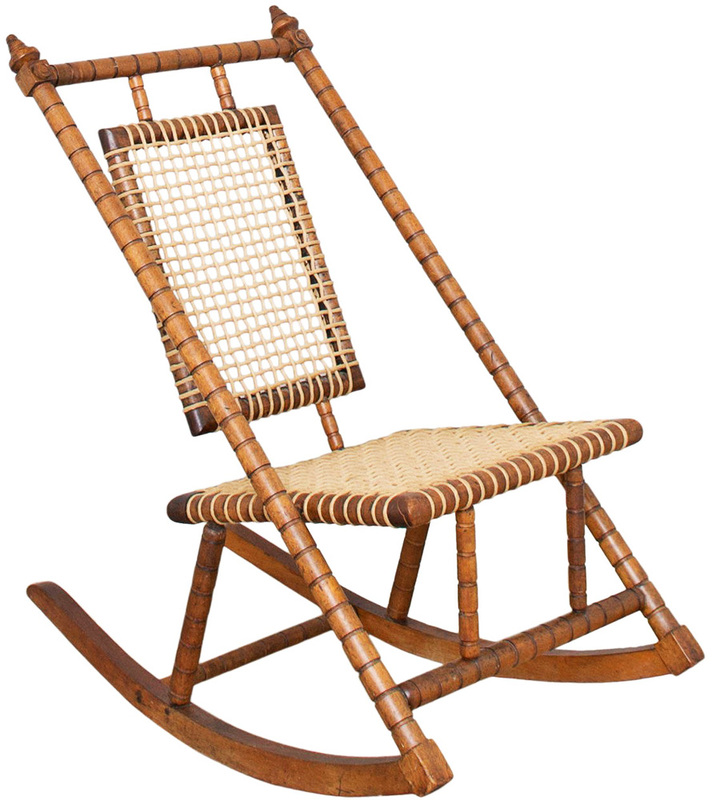 Right, a folding rocking chair featuring original fabric, circa 1870, and Hunzinger’s metal rails patented in 1878 (model shown below). Via the Brooklyn Museum. Born in 1835 to a cabinetmaking family in Tuttlingen, Germany, George Hunzinger began apprenticing with his father when he was 14 and immigrated to Brooklyn, New York, around age 20. After Hunzinger arrived in New York, he worked for Auguste Pottier, a cabinetmaker of French origin, and by 1860, Hunzinger’s name was appearing independently in a Brooklyn business directory. “Pottier was an upper-end cabinetmaker, who eventually joined up with another fellow by the name of Stymus,” Harwood explains. “Pottier & Stymus was a decorating and furniture-making firm with elite clients. They were dealing with the first robber barons.” And yet, beginning with Hunzinger’s first patented design in 1860, his products were aimed at a very different clientele than his employer. “Hunzinger’s furniture was not consumed by the super rich, but rather by the upper middle class,” Harwood says. “His first patent was for a dining table that ingeniously incorporates the leaves to expand the table underneath: As you pull the table apart, the leaves pop up, which is pretty clever—rather than requiring you to store the leaves separately in the closet.” The table’s crank mechanism also allowed one to raise and lower the additional leaves without the help of others. Left, an 1874 advertisement shows two Hunzinger designs patented in the 1860s. Via the Thomas J. Watson Library, Metropolitan Museum of Art, New York. 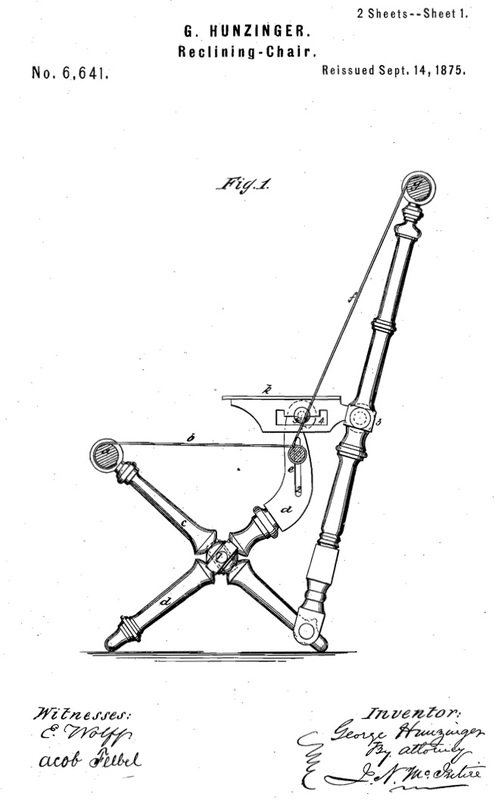 Right, the model for Hunzinger’s 1878 patent application displays a chair frame strengthened with strips of metal. Via the Brooklyn Museum. In the 1860s, Hunzinger launched his own business, focusing on urban middle-class buyers who wanted novel, fashionable, and versatile items to decorate their homes. Most of Hunzinger’s pieces fell squarely into the emerging field of “patent furniture,” which adopted mechanical improvements to make adjustable, multi-purpose furniture for saving space and improving comfort. 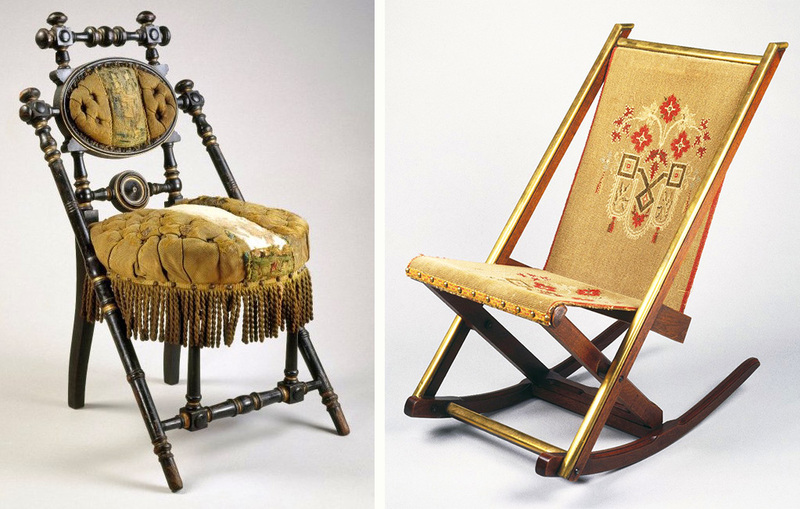 “By 1861, he started patenting folding chairs, which became a sort of obsession,” Harwood says. Much like today, convertible furniture—including folding chairs, sofa beds, and card tables—was very appealing to urban residents with limited space. 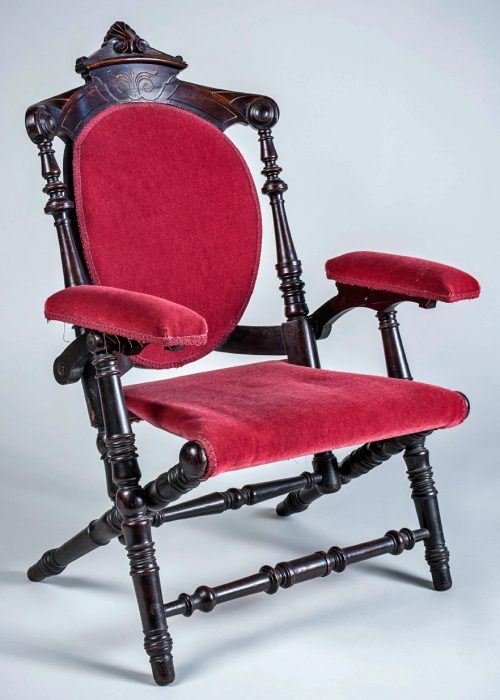 This armchair’s original overstuffed cushion and fringed back panel overpower the whimsical geometric shapes of its turned wood members, circa 1869. Via the Brooklyn Museum. In addition to his technical virtuosity, Hunzinger employed clever marketing tactics, which included providing a variety of finishes and upholsteries for each item, thus allowing shoppers to customize their purchases. “In the 1870s, this notion of consumer choice was just beginning to take shape,” Harwood says. “Hunzinger would offer the same chair with different stains, ranging from a very light blonde to ebonized wood, and different styles of upholstery, from simple cotton reps—a kind of corduroy—to fancy silk velvets. 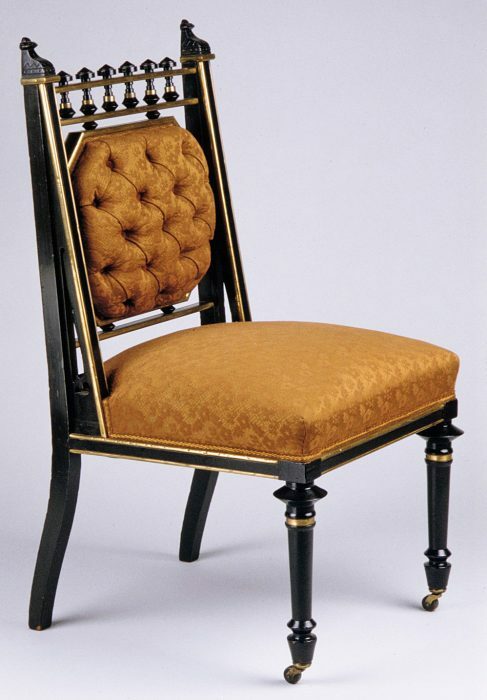 He even started to gild some of the chairs in the mid-1870s, which indicates his shop was pretty successful because that required a trained gilder and a dust-free space in the factory.” The same item could thus be purchased at varying price points, appealing to different income levels within the middle- to upper-middle-class market. “We take that for granted, but in the 1870s, this kind of marketing was new,” Harwood adds. 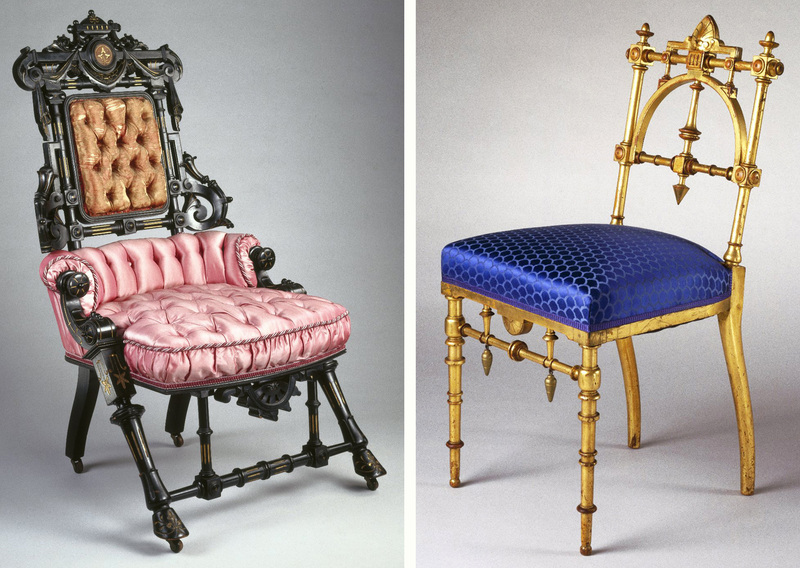 Left, an 1869 Hunzinger chair of ebonized wood features overt ornamentation popular at the time, including the center crest and hoof feet (original upholstery was purple damask). Via the Brooklyn Museum. 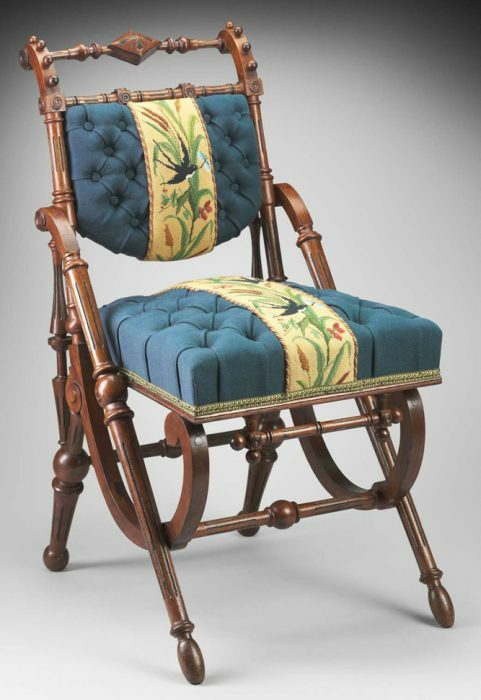 Right, a more streamlined Hunzinger chair, circa 1885, features original gilded wood with updated upholstery. Via the Brooklyn Museum. This 1890s Hunzinger chair came with a removable leather back panel, which partially hid the frame’s simple geometry. Via the Brooklyn Museum. Almost half a century before the design movement known as Modernism, Hunzinger applied similar tenets to his furniture—focusing on function rather than ornamentation and utilizing geometric forms inspired by the simple lines of machinery. To be sure, other furniture companies relied on current technology to produce their pieces, but they typically did so in the service of extraneous ornamentation demanded by popular Victorian styles like Eastlake or Rococo Revival. “In the early part of the 19th century,” Harwood says, “furniture makers and designers were trying to devise a machine that could carve flowers, because that was the most time-consuming part of furniture-making, requiring the greatest skill. But a machine doesn’t really want to do that.” Different carving machines were developed, but they could never could match what a skilled craftsperson could do by hand. 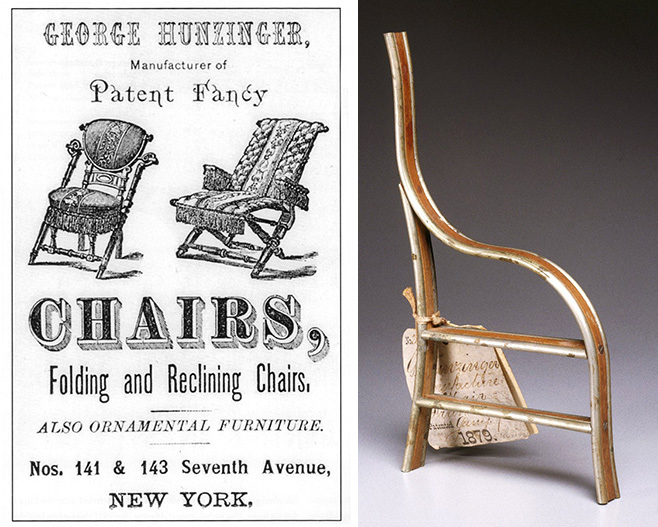 A drawing for Hunzinger’s 1875 reclining-chair patent exemplifies his streamlined vision. That said, Hunzinger wasn’t immune to fads, and he often incorporated elements of concurrent design trends into his work. 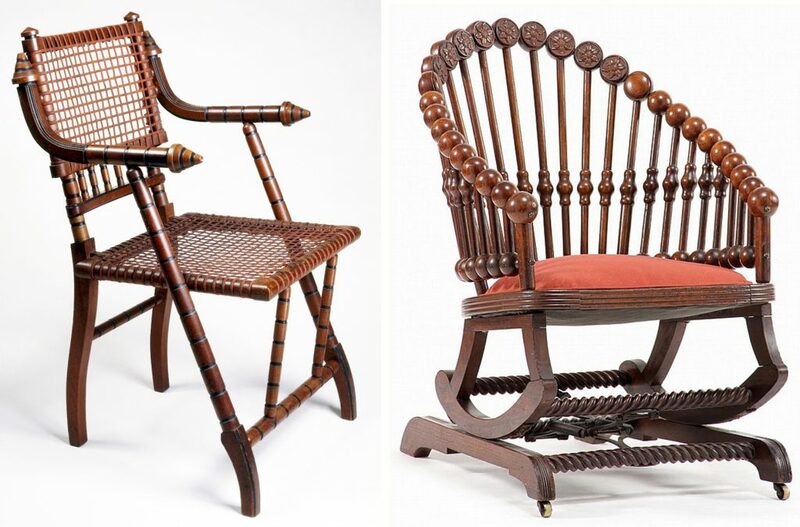 As Harwood explains in his book, “Hunzinger was willing to offer his inventive chair designs in the aesthetically pared-down version of his original conception or cloaked in a more accessible, popular, and conventional historical revivalism.” Today, the most striking Hunzinger products tend to be those that were originally the cheapest—the least-embellished versions. Left, an armchair, circa 1876, includes turned conical details inspired by ancient furniture combined with a seat and back of Hunzinger’s patented fabric-wrapped steel wires. Via the Brooklyn Museum. Right, a chair with a stationary-rocker base and Hunzinger’s distinctive “Lollipop” style back, circa 1870. Via Leland Little Auctions. 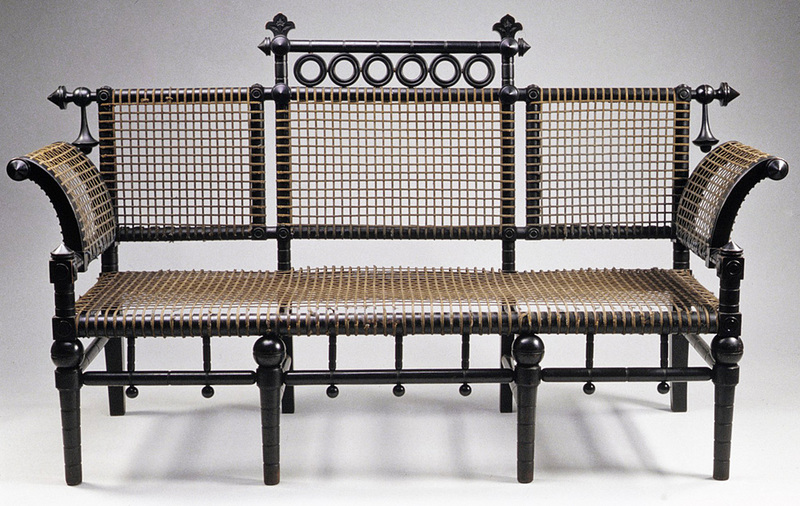 A striking settee incorporating Hunzinger’s wire-mesh patent, circa 1876-1885. Via the Metropolitan Museum of Art, New York. Despite the chair’s popularity, it’s likely many buyers never knew Hunzinger’s name due to the furniture distribution model: Hunzinger had a factory and showroom in New York City, but most of his products were sold through wholesalers in other cities. For consumers, the idea that these products were patented—implying innovation and novelty—was typically more important than a brand or designer, so they were generally advertised without the maker’s name. 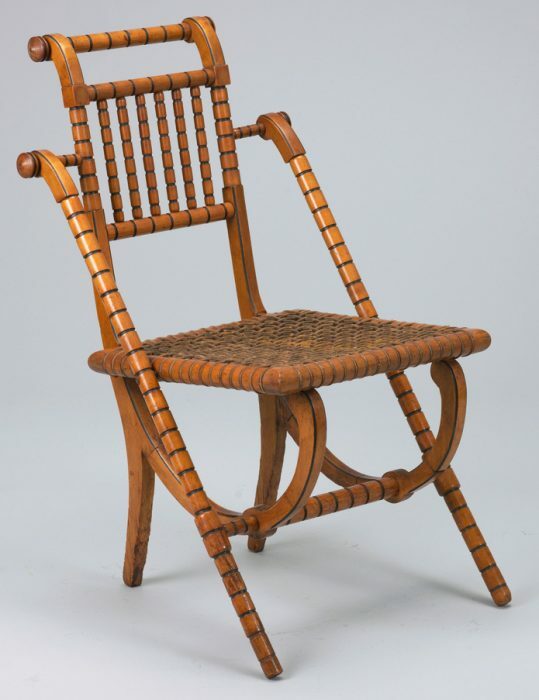 A Hunzinger side chair from the 1880s featuring his patented inset straw-braiding on the rails, stiles, legs and apron. Via the Brooklyn Museum. 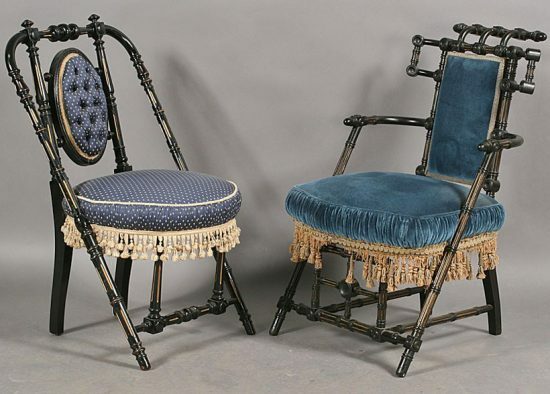 A pair of ebonized Hunzinger chairs, circa 1870. Via Live Auctioneers. 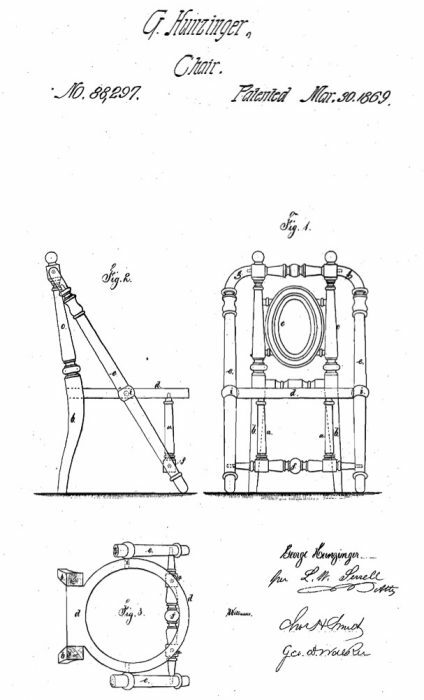 An 1869 Hunzinger patent drawing for a chair with elegant angled bracing. 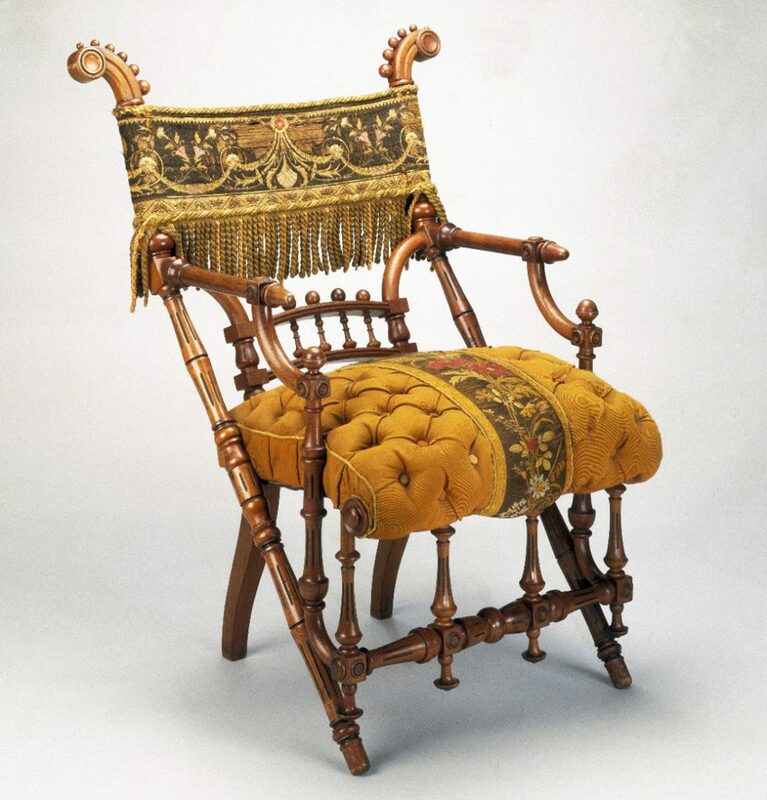 A Hunzinger X-frame armchair, circa 1870s. Via Live Auctioneers. 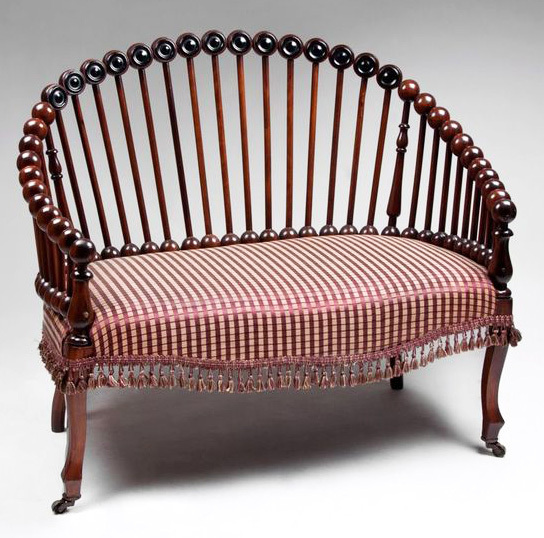 A Hunzinger Lollipop settee, circa 1890. Via Ruby Lane. 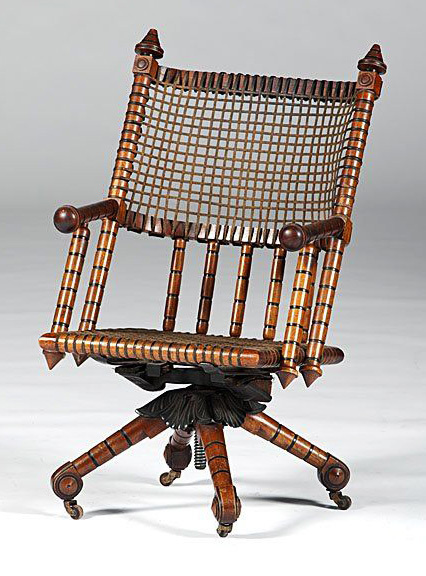 A Hunzinger rolling chair with bamboo-style members, circa 1870s. Via Live Auctioneers. 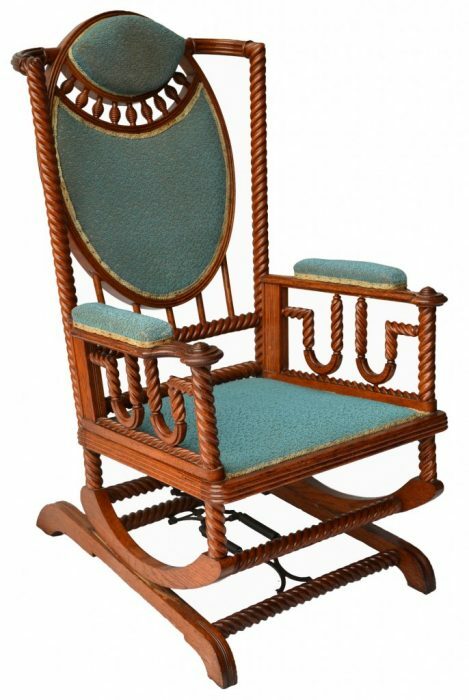 A Hunzinger rocking chair, circa 1890. Via Southampton Antiques. 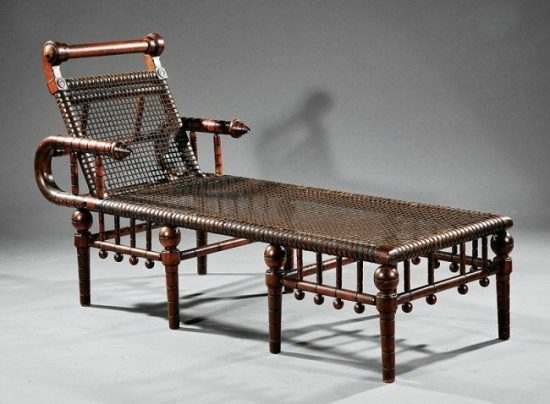 An 1870s Hunzinger daybed with wire webbing and an adjustable back. Via Neal Auction Company. A Hunzinger chair with his patented metal reinforcements, circa 1878. Via the Metropolitan Museum of Art. 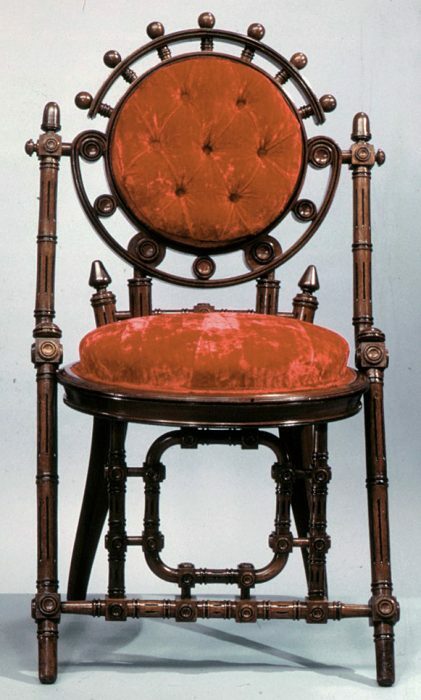 A Hunzinger side chair in a Neoclassical form, circa 1869. Via the Cooper Hewitt Museum. 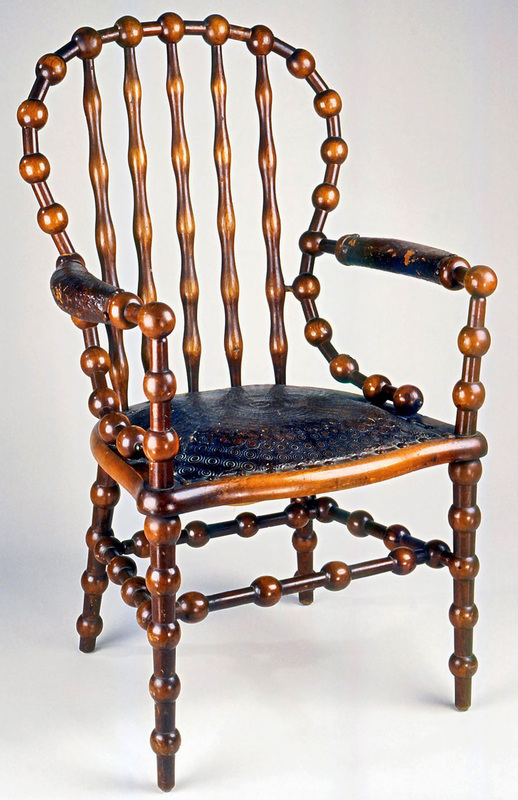 This chair's structure, circa 1870, is similar to the previous example, though its wood turning and reproduced upholstery completely change the effect. Via the Museum of Fine Arts, Boston. A Hunzinger chair with machine-inspired detailing, circa 1870s. Via the Metropolitan Museum of Art. “ ” One of the best pressmen in the business was Levon Mosgofian, who owned and operated Tea Lautrec Litho.